Futangue is a new hotel and nature reserve seated at the foot of the Andes in Chile's Lake District. Experience the volcanic Puyehue National Park and the biodiversity of the Valdivian rainforest, and roam 110 kilometres of quiet trails of spectacular fauna, untouched flora, mesmerising lakes, and ancient forests. Futangue boasts a year-round offering of excursions of all kinds. Climb volcanoes, cycle through untouched forests, kayak around turquoise waterfalls, sail on pristine lakes, fish for rare catch, watch birds, or rest in hot springs. Amidst exploring this playground of nature, enjoy a equal dose of culture with visits to charming local villages. Most excursions are operated within the reserve, but a selection will take you further afield in the Lake Ranco area. You'll be transported to all start and end points, and accompanied by guides throughout the activity. You can choose between full day excursions with lunch included or two half day excursions, returning to the hotel for lunch in between. Excursions can be booked at the hotel, with guides able to make recommendations. Please note that all excursions are subject to availability and weather conditions. You're invited to explore the Patagonian Andes in the exclusivity of this private nature reserve. Trek through native forests to reach the Pichi Lake, nestled in an amphitheatre of majestic mountains and waterfalls. Hike to the summit of Mayo Mountain, 1287 meters in height and offering incredible 360° views of snow-capped volcanoes and Lake Ranco. Venture into "Pledges Quemadas", a remote and almost unexplored river of volcanic lava, or seek out the mystery sunken forest of Green Lake, combining with a kayak to the fumaroles and hot springs on the other side. Treks range in difficulty from relaxed to strenuous, and duration from a few hours to a full day. Some include transport by car to reach the start/end points, and others are combined with the likes of kayaking or nature spotting and photography. The guides set a pace to suit the individual guests on each hike, and will stop along the way to point out details in the views and to draw attention to the wildlife. Enjoy a horse ride among picturesque flower-filled meadows, turoise waterfalls, and centuries-old trees, through the Trahuilco valley, inside of the park. You will stop along the away to appreciate the stunning Rininahue River and a lookout point with 360° views of the mountains and volcanoes that surround the hotel. Six scenic fly fishing excursions are on offer, the majority within the waters of the park with access exclusively for guests. Expect to enjoy world-class fishing for rainbow and brown trouts, with a special sense of privacy and connectivity. Fish surrounded by native forest at Pichi Lake, take your camera with you for excellent photo opportunities as you make your way to the hidden Los Colpos Lake, or breeze through forests on quad bikes to arrive to Pitreno Lake. Regarded as one of the most legendary rivers of the angling world, fish the crystal clear Calcurrupe River by boat, alongside expert boatmen. A range of half day kayaks of moderate difficulty are available, and taking to the water is not only an amazing way to take in the surroundings from a different perspective, but to also forge your own way into areas otherwise restricted in access. Paddle on Pichi Lake, nestled amid lush vegetation and forest-covered mountains, then hike to the hidden Black Lagoon, or kayak the vast Calcurrupe River, located in one of the most beautiful valleys of the Andes. A rafting excursion in the pristine Rininahue River is also offered. Experience the exhilaration of floating through its class 3 rapids and marvel at its turquoise pools and wild nature scenery. Please note that a minimum of four and a maximum of twelve guests are required for this activity. Located in the Chilean Northern Patagonia among the foothills of the Andes Mountains in the Los Rios Region (Chile's Lake District), Hotel Funtangue is based within one of the most biodiverse rainforests in the world - the Valdivian - and just outside of the volcanoes and lava fields of the Puyehue National Park. The 70 miles of world-class trails within the park are predominately used by guests alone, and are designed to ensure the independent discovery of the beauty of the land. Think feeling that you're the very first person to ever experience an area. 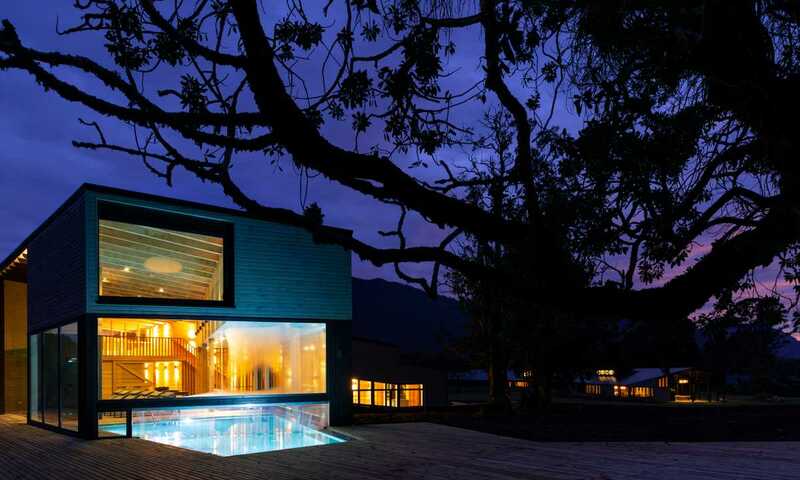 Perched on the shores of one of Chile's largest lakes, Lake Ranco, private access to the beach is also offered. Futangue can be reached with great ease, despite its remoteness. The transfer from Osorno Airport is just an hour and a half, and the route along asphalt roads promises to present you with an unforgettable experience before arriving at the hotel. Flights from Santiago to Osorno are regular and also take an hour and a half. Transfers from other nearby airports are also available; Valdivia is a two hours drive and Puerto Montt two hours and a half. Hotel Futangue's gastronomy is focussed on authentic regional flavours with the best ingredients, sourced from the surrounding forests and local suppliers. There is an unmissable passion for sharing the gorgeous flavours and textures both grown and used in the North Patagonian region. Dive into a culinary journey as you sample native fruit and wild mushrooms, hydroponic vegetables from the greenhouse, and seafood from the coast of Valdivia, and look forward to dinners finished with homemade ice creams and artisan liquors. Guests with all inclusive itineraries will be served breakfasts, lunches, dinners, and alcoholic beverages/soft drinks (additional cost for premium wines and liquors). Dietary restrictions and personal wishes can be accommodated where requested in advance. Futangue offers guest an experience of wild adventure with luxury and comfort. 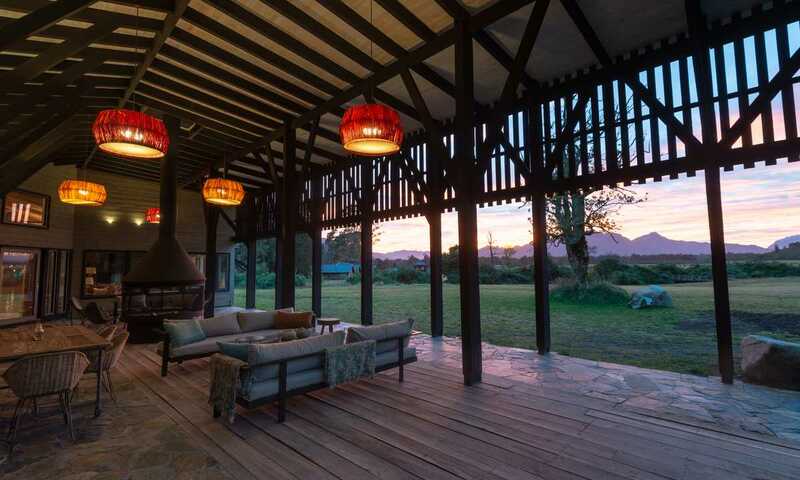 The architecture highlights the region's native wood and complements the natural environment, assimilating the classic barns and stables of the south of Chile. The decoration uses ethnic fabrics and colourful textiles, which are inspired by national artists and objects from the Mapuche culture. The local traditions and natural heritage are present in every aspect of the design. The accommodation includes two charming and comfortable buildings: the Explorer's House (16 rooms) and the Caulle House (10 rooms). These buildings are only 120 meters apart and share the same restaurant, which is based at the Explorer's House. Just steps from the hotel is the spa, constructed of native wood and volcanic stones, representing Futangue's natural heritage and identity, and surrounded by mountains and picturesque rural landscape. Relax in the heated indoor pool next to the fire, use the sauna while gazing at spectacular waterfalls, swim in the outdoor semi-Olympic heated pool, release some endorphins in the gym, or book yourself in for a massage. Please note that massage therapies and treatments are an additional cost, payable locally. A four-night all inclusive stay in a superior room in double occupancy starts at USD $2,280 per person. The rates include transfer to the hotel, daily excursions, use of the spa (additional cost for treatments), breakfast, lunch and dinner, alcoholic beverages and soft drinks (additional cost for premium wines and liquors), access to the exclusive 70 mile network of trails, and Wifi. Other programmes offering both single and double occupancy include full-board + excursions, half board, and bed & breakfast. Please enquire for more details. Explorer's rooms are 25 metres square, characterised by warm and cozy spaces, and feature large windows overlooking the garden and forests. Each room is natural in style, furnished with rustic pieces and leathers, and exclusive noble wood coverings. The bathrooms contain organic amenities utilising plants from the native forest. Superior rooms are 26 metres squared and look out to incredible views of the hills and gardens. Suites are 35 metres square and offer a small living room from which to soak up beautiful views of the park.